Lots of Network-Attached Storage (NAS) vendors tell a High-Performance Computing (HPC) story. But the reality is that most of these vendors do not have the architecture that will let them meet the performance demands of today’s HPC clusters. Inherent limitations in their traditional NAS architectures just aren’t able to keep up. 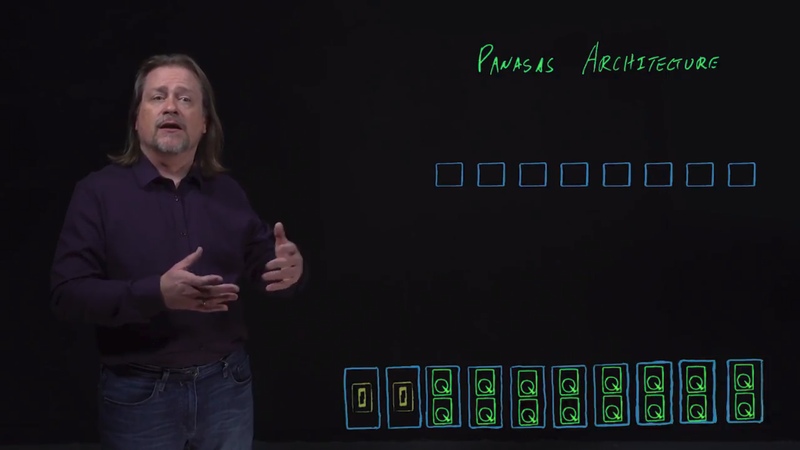 Panasas has put together a video that takes a close look at the key differences in storage architecture between Enterprise NAS products and NAS solutions built to serve the Commercial HPC market. It compares architectures from NAS vendors NetApp, Isilon, and Panasas. 1. How many NAS heads do I need? Did you know that how your NAS vendor utilizes (or doesn’t utilize) NAS heads in their architecture has a major impact on speed and price? A vendor like NetApp leverages a pair-wise structure of controllers which results in having to provision twice as many controllers as needed, leaving each 50% idle, in order to not suffer dramatic performance losses if one of them fails. The Panasas ActiveStor architecture does away with NAS heads altogether by relying on dedicated Director nodes for metadata, and dedicated nodes for storage – and distributing the work such that if one of them fails overall performance only drops by a small fraction. That means you can provision what you need, and scale-up when your workload demands it, without paying for hardware that is not contributing to your performance. 2. How do I get the highest possible performance? As you might expect, to get great performance you have to start with a great architecture and then build a great implementation. Traditional NAS architectures that need a “back end network” so the NAS nodes can to talk to each other suffer in at least two important ways: the direct cost and complexity of the back end network, and the performance bottleneck of moving your data between those NAS nodes, across the back end network, and funneling them out through another NAS node to the client system. It’s all just needlessly inefficient. The Panasas ActiveStor architecture has no back end network, it transfers your data from storage nodes directly to your client systems, and there’s nothing but pure networking between you and your data. Plus, since every file is striped across multiple storage nodes for erasure coded data protection, we’re going read those stripes in parallel and multiply the performance of your files. To see an in depth comparison of different NAS architectures side-by-side and to learn more about how NAS architectures influence your business outcome, watch this video.